I have read that Jalfrezi dishes originated during British rule in west Bengal region of India. Jalfrezi is either considered as a Bengali food, Mughal food or combination of both. 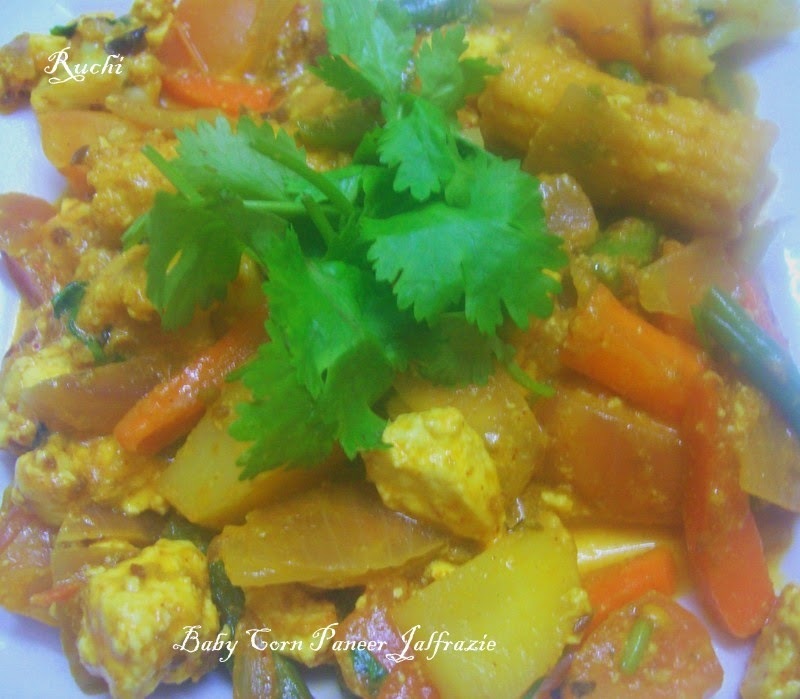 This tangy Jalfrezi is a delicious mélange of low fat paneer and low calorie vegetables like baby corn and capsicum and spiced up with colourful and sizzling vegetables .This dish is slow cooked in the tomato sauce with authentic Indian spices to give a wonderful aroma .This veggies dish not only looks pleasing to the eyes but also is appealing to the taste buds. This is a perfect main meal if you are a vegetarian, and is incredibly quick and easy to make .It is a perfect side dish for rotis.nan, Kulcha & Rice. 1. Cut all the vegetables like Baby Corn, Capsicum, carrot, beans into strips (lengthwise) and Onions into medium sized cubes; Keep aside. 3. Heat Oil in a pan, add the Cumin Seeds or Jeera and Asafoetida or Hing. When they crackle/splutter, add the chopped Onions and Turmeric Powder and fry for 2-3 minutes. Now add Ginger + Garlic Paste to the pan and fry until the aroma of the paste disappears. 4. Now add the chopped Tomatoes to the pan and cook until they turn tender. 5. Add red chili powder , kasuri methi, coriander powder and salt. Mix well. Add tomato puree and cook for 3 mts. Add sliced beans, carrots and cook for 5 mts on low to medium flame. Mix once in a while. 6 Then At this stage, add the Baby Corn, kasuri methi,capsicum pieces and Toss gently and salt and Add tomato ketchup and saute on a low flame for 4 to 5 minutes until the baby corn is half cooked. 7. Sprinkle 3-4 tbsps of water and mix well. Cook for 4-5 mts on medium high flame tossing the contents. 8. Add the paneer cubes garam masala,& mix to coat it well with the masala. Adjust seasoning. 9. 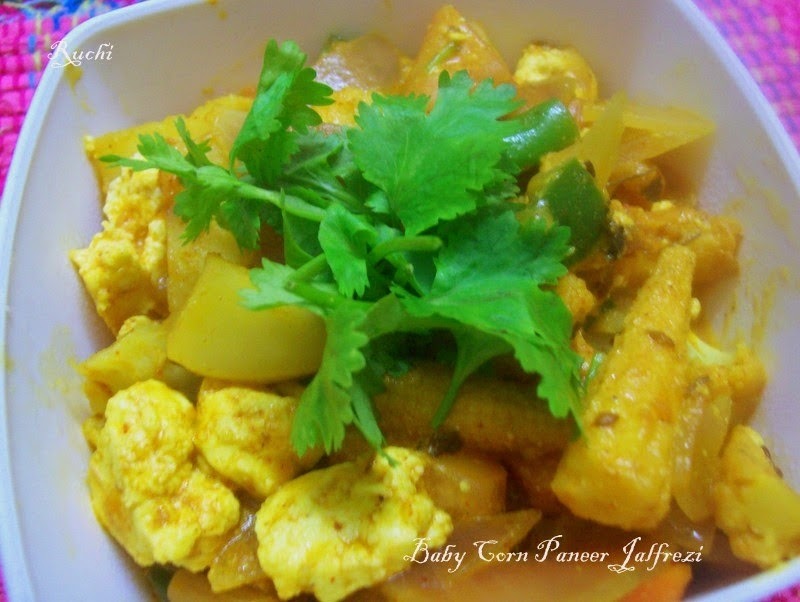 Transfer the Baby Corn Paneer Jalfrezi to a bowl and garnish with chopped coriander or Cilantro. My all time favourite akka,love it very much.